If you fail to be charmed by bike-powered entrepreneurship, then your little black heart may well be beyond redemption. Whether it’s an eco-powered three-wheeler serving up tacos and breakfast burritos (El TacoBike) or shade-grown coffee beans delivered by former Wall Street Guys (Bicycle Coffee), bike delivery gives a twee boost to any product’s appeal. Bread Srsly, the vowel-impaired new venture by Sadie Scheffer, gets further "meet cute" charm points with its backstory. Scheffer, a former engineering student, started tinkering with gluten-free baking recipes to win the heart of a boy (awwww). She shared “many a lunch of uninspiring GF toast” with the object of her affection before finding a recipe that worked. Later, when she got more serious about baking, Scheffer started having unpleasant reactions to some of her ingredients, namely tapioca starch, potato, and garbanzo. This spurred her on to a new mission, creating bread for people with all types of dietary restrictions. Her breads are now free of wheat, dairy, egg, nut, soy, potato, and tapioca. She also bakes custom loaves for customers with uncommon sensitivities. I recently tried some of Scheffer’s apricot cinnamon bread, and some lemon poppyseed muffins. They’re dense, heavy-duty numbers, subtly flavored and not too sweet. A bit hearty for my taste, but they weren’t too bad toasted up for breakfast with a little butter (I’m sure a non-dairy substitute would work, too). Also: Nothing beats an old-timey home bread delivery. 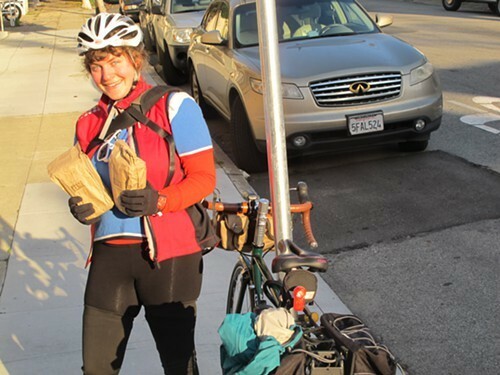 Scheffer bikes her goods all over the East Bay on Thursdays. Visit BreadSrsly.com to pre-order.